The collapse of communist regimes in Central and Eastern Europe marked a historical event for the countries on both sides of the iron curtain. Using the recently released EU KLEMS database on detailed sectoral growth and employment measures, we analyse the productivity performance in the period after 1995 for five transition economies, i.e. the Czech Republic, Hungary, Poland, the Slovak Republic and Slovenia, and compare their performance with a group of European core economies and partly Austria as a neighbouring small open economy. Our analysis reveals a strong catching-up process with the Western European economies in terms of productivity and sectoral structures. The factors driving this convergence process, however, differ across countries and industries. Apart from an analysis at the aggregate or broad sectoral performance we devote special emphasis to the detailed industry level and in particular to the manufacturing industry, which has served as the main driver in growth and productivity. We demonstrate that the Central and Eastern European countries have successfully specialized in higher-tech industries while maintaining gaps, albeit diminishing, in services. 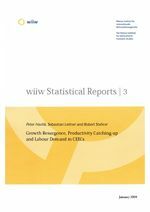 As the strong productivity catching-up was accompanied by low employment growth in the period 1995-2004 - despite high unemployment levels - we also investigate the labour market structures and the changes in patterns of employment.